Web inventor Sir Tim Berners-Lee has spoken about the importance of net neutrality, making data open and sharable, and a need for the public to hold governments to account over their online surveillance activities. Speaking at a press Q&A at IP Expo, he said: "We all need to make sure that when contingency powers are put in place, there needs to be a system that we all know about where an agency watches the watchers and guards the guards. "It needs public discussions and it's tricky. it's a difficult problem but we need something more powerful and transparent." Berners-Lee's comments followed a keynote speech that the inventor used to call for greater levels of data sharing and a need to continue working to keep the web as a decentralised platform. Businesses will need to be more transparent with their supply chains regarding how they use their own data, he added, as "smarter computing" will see computers communicate and do the planning in the future, rather than humans. He also praise big data's ability to impact what can be done on the web, but he warned firms against using it for serving "queasy" targeted advertising, and should insted merge it with data from other sources to create "rich data". 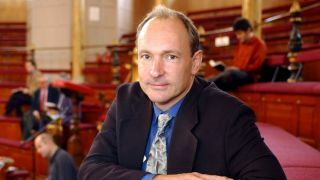 Berners-Lee, who founded the World Wide Web Foundation in 2009 with the aim of getting more of the world's population online, also praised the efforts of governments and industry to connect the remaining 60% of the globe to the internet, but insisted that there is still work to be done in developed countries. "If you look at the market, phones are getting cheaper and data more accessible, but it's going to take a long time," he said. "The World Wide Web Foundation and others noticed a problem in that it can cost a serious proportion of your entire income to get connected. It's a question of how do we move faster and fairer, making sure that it's not just for the well-off." What was that PRISM business all about?